For other uses, see Lighthouse (disambiguation). Aerial drone footage of the Roman Rock Lighthouse off the southern coast of South Africa. Before the development of clearly defined ports, mariners were guided by fires built on hilltops. Since raising the fire would improve the visibility, placing the fire on a platform became a practice that led to the development of the lighthouse. In antiquity, the lighthouse functioned more as an entrance marker to ports than as a warning signal for reefs and promontories, unlike many modern lighthouses. The most famous lighthouse structure from antiquity was the Pharos of Alexandria, Egypt, which collapsed following a series of earthquakes between 956 and 1323. The intact Tower of Hercules at A Coruña, Spain gives insight into ancient lighthouse construction; other evidence about lighthouses exists in depictions on coins and mosaics, of which many represent the lighthouse at Ostia. Coins from Alexandria, Ostia, and Laodicea in Syria also exist. The modern era of lighthouses began at the turn of the 18th century, as lighthouse construction boomed in lockstep with burgeoning levels of transatlantic commerce. Advances in structural engineering and new and efficient lighting equipment allowed for the creation of larger and more powerful lighthouses, including ones exposed to the sea. The function of lighthouses shifted toward the provision of a visible warning against shipping hazards, such as rocks or reefs. Winstanley's lighthouse at the Eddystone Rocks marked the beginning in a new phase of lighthouse development. The Eddystone Rocks were a major shipwreck hazard for mariners sailing through the English Channel. The first lighthouse built there was an octagonal wooden structure, anchored by 12 iron stanchions secured in the rock, and was built by Henry Winstanley from 1696 to 1698. His lighthouse was the first tower in the world to have been fully exposed to the open sea. The civil engineer, John Smeaton, rebuilt the lighthouse from 1756–59; his tower marked a major step forward in the design of lighthouses and remained in use until 1877. He modeled the shape of his lighthouse on that of an oak tree, using granite blocks. He rediscovered and used "hydraulic lime," a form of concrete that will set under water used by the Romans, and developed a technique of securing the granite blocks together using dovetail joints and marble dowels. The dovetailing feature served to improve the structural stability, although Smeaton also had to taper the thickness of the tower towards the top, for which he curved the tower inwards on a gentle gradient. This profile had the added advantage of allowing some of the energy of the waves to dissipate on impact with the walls. His lighthouse was the prototype for the modern lighthouse and influenced all subsequent engineers. John Smeaton's rebuilt version of the Eddystone Lighthouse, 1759. This represented a great step forward in lighthouse design. One such influence was Robert Stevenson, himself a seminal figure in the development of lighthouse design and construction. His greatest achievement was the construction of the Bell Rock Lighthouse in 1810, one of the most impressive feats of engineering of the age. This structure was based upon Smeaton's design, but with several improved features, such as the incorporation of rotating lights, alternating between red and white. Stevenson worked for the Northern Lighthouse Board for nearly fifty years during which time he designed and oversaw the construction and later improvement of numerous lighthouses. He innovated in the choice of light sources, mountings, reflector design, the use of Fresnel lenses, and in rotation and shuttering systems providing lighthouses with individual signatures allowing them to be identified by seafarers. He also invented the movable jib and the balance-crane as a necessary part for lighthouse construction. Alexander Mitchell designed the first screw-pile lighthouse – his lighthouse was built on piles that were screwed into the sandy or muddy seabed. Construction of his design began in 1838 at the mouth of the Thames and was known as the Maplin Sands lighthouse, and first lit in 1841. Although its construction began later, the Wyre Light in Fleetwood, Lancashire, was the first to be lit (in 1840). The source of illumination had generally been wood pyres or burning coal. The Argand lamp, invented in 1782 by the Swiss scientist, Aimé Argand, revolutionized lighthouse illumination with its steady smokeless flame. Early models used ground glass which was sometimes tinted around the wick. Later models used a mantle of thorium dioxide suspended over the flame, creating a bright, steady light. The Argand lamp used whale oil, colza, olive oil or other vegetable oil as fuel which was supplied by a gravity feed from a reservoir mounted above the burner. The lamp was first produced by Matthew Boulton, in partnership with Argand, in 1784 and became the standard for lighthouses for over a century. South Foreland Lighthouse was the first tower to successfully use an electric light in 1875. The lighthouse's carbon arc lamps were powered by a steam-driven magneto. John Richardson Wigham was the first to develop a system for gas illumination of lighthouses. His improved gas 'crocus' burner at the Baily Lighthouse near Dublin was 13 times more powerful than the most brilliant light then known. An 85mm Chance Brothers Incandescent Petroleum Vapour Installation which produced the light for the Sumburgh Head lighthouse until 1976. The lamp (made in approx. 1914) burned vaporized kerosene (paraffin); the vaporizer was heated by a denatured alcohol (methylated spirit) burner to light. When lit some of the vaporised fuel was diverted to a Bunsen burner to keep the vaporizer warm and the fuel in vapor form. The fuel was forced up to the lamp by air; the keepers had to pump the air container up every hour or so. This in turn pressurized the paraffin container to force the fuel to the lamp. The "white sock" is in fact an unburnt mantle on which the vapor burned. The vaporized oil burner was invented in 1901 by Arthur Kitson, and improved by David Hood at Trinity House. The fuel was vaporized at high pressure and burned to heat the mantle, giving an output of over six times the luminosity of traditional oil lights. The use of gas as illuminant became widely available with the invention of the Dalén light by Swedish engineer, Gustaf Dalén. He used Agamassan (Aga), a substrate, to absorb the gas allowing safe storage and hence commercial exploitation. Dalén also invented the 'sun valve', which automatically regulated the light and turned it off during the daytime. The technology was the predominant form of light source in lighthouses from the 1900s through the 1960s, when electric lighting had become dominant. With the development of the steady illumination of the Argand lamp, the application of optical lenses to increase and focus the light intensity became a practical possibility. William Hutchinson developed the first practical optical system in 1763, known as a catoptric system. This rudimentary system effectively collimated the emitted light into a concentrated beam, thereby greatly increasing the light's visibility. The ability to focus the light led to the first revolving lighthouse beams, where the light would appear to the mariners as a series of intermittent flashes. It also became possible to transmit complex signals using the light flashes. French physicist and engineer Augustin-Jean Fresnel developed the multi-part Fresnel lens for use in lighthouses. His design allowed for the construction of lenses of large aperture and short focal length, without the mass and volume of material that would be required by a lens of conventional design. A Fresnel lens can be made much thinner than a comparable conventional lens, in some cases taking the form of a flat sheet. A Fresnel lens can also capture more oblique light from a light source, thus allowing the light from a lighthouse equipped with one to be visible over greater distances. The first Fresnel lens was used in 1823 in the Cordouan lighthouse at the mouth of the Gironde estuary; its light could be seen from more than 20 miles (32 km) out. Fresnel's invention increased the luminosity of the lighthouse lamp by a factor of four and his system is still in common use. The advent of electrification, and automatic lamp changers began to make lighthouse keepers obsolete. For many years, lighthouses still had keepers, partly because lighthouse keepers could serve as a rescue service if necessary. Improvements in maritime navigation and safety such as the Global Positioning System (GPS) have led to the phasing out of non-automated lighthouses across the world. In Canada, this trend has been stopped and there are still 50 staffed light stations, with 27 on the west coast alone. Remaining modern lighthouses usually have solar-charged batteries and have a single stationary flashing light sitting on a steel skeleton tower. 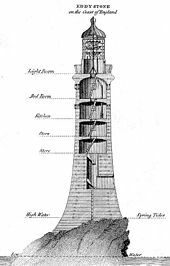 John Smeaton is noteworthy for having designed the third and most famous Eddystone Lighthouse, but some builders are well known for their work in building multiple lighthouses. The Stevenson family (Robert, Alan, David, Thomas, David Alan, and Charles) made lighthouse building a three-generation profession in Scotland. Irishman Alexander Mitchell invented and built a number of screwpile lighthouses despite his blindness. Englishman James Douglass was knighted for his work on lighthouses. United States Army Corps of Engineers Lieutenant George Meade built numerous lighthouses along the Atlantic and Gulf coasts before gaining wider fame as the winning general at the Battle of Gettysburg. Colonel Orlando M. Poe, engineer to General William Tecumseh Sherman in the Siege of Atlanta, designed and built some of the most exotic lighthouses in the most difficult locations on the U.S. Great Lakes. French merchant navy officer Marius Michel Pasha built almost a hundred lighthouses along the coasts of the Ottoman Empire in a period of twenty years after the Crimean War (1853–1856). 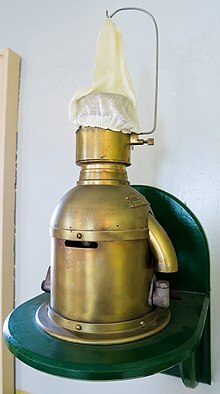 In a lighthouse, the source of light is called the "lamp" (whether electric or fuelled by oil) and the concentration of the light is by the "lens" or "optic". Originally lit by open fires and later candles, the Argand hollow wick lamp and parabolic reflector were introduced in the late 18th century. Whale oil was also used with wicks as the source of light. Kerosene became popular in the 1870s and electricity and carbide (acetylene gas) began replacing kerosene around the turn of the 20th century. Carbide was promoted by the Dalén light which automatically lit the lamp at nightfall and extinguished it at dawn. During the Cold-War, many remote Soviet lighthouses were powered by radioisotope thermoelectric generators (RTGs). These had the advantage of providing power day or night and did not need refuelling or maintenance. However, after the breakdown of the Soviet Union, there are no official records of the locations or condition of all of these lighthouses. As time passes, their condition is degrading; many have fallen victim to vandalism and scrap metal thieves, who may not be aware of the dangerous radioactive contents. Before modern strobe lights, lenses were used to concentrate the light from a continuous source. Vertical light rays of the lamp are redirected into a horizontal plane, and horizontally the light is focused into one or a few directions at a time, with the light beam swept around. As a result, in addition to seeing the side of the light beam, the light is directly visible from greater distances, and with an identifying light characteristic. This concentration of light is accomplished with a rotating lens assembly. In early lighthouses, the light source was a kerosene lamp or, earlier, an animal or vegetable oil Argand lamp, and the lenses rotated by a weight driven clockwork assembly wound by lighthouse keepers, sometimes as often as every two hours. The lens assembly sometimes floated in liquid mercury to reduce friction. In more modern lighthouses, electric lights and motor drives were used, generally powered by diesel electric generators. These also supplied electricity for the lighthouse keepers. Efficiently concentrating the light from a large omnidirectional light source requires a very large diameter lens. This would require a very thick and heavy lens if a conventional lens were used. The Fresnel lens (pronounced /freɪˈnɛl/) focused 85% of a lamp's light versus the 20% focused with the parabolic reflectors of the time. Its design enabled construction of lenses of large size and short focal length without the weight and volume of material in conventional lens designs. Fresnel lighthouse lenses are ranked by order, a measure of refracting power, with a first order lens being the largest, most powerful and expensive; and a sixth order lens being the smallest. The order is based on the focal length of the lens. A first order lens has the longest focal length, with the sixth being the shortest. Coastal lighthouses generally use first, second, or third order lenses, while harbor lights and beacons use fourth, fifth, or sixth order lenses. Some lighthouses, such as those at Cape Race, Newfoundland, and Makapuu Point, Hawaii, used a more powerful hyperradiant Fresnel lens manufactured by the firm of Chance Brothers. In recent times, many Fresnel lenses have been replaced by rotating aerobeacons which require less maintenance. In modern automated lighthouses, this system of rotating lenses is often replaced by a high intensity light that emits brief omnidirectional flashes (concentrating the light in time rather than direction). These lights are similar to obstruction lights used to warn aircraft of tall structures. Recent innovations are "Vega Lights", and initial experiments with light-emitting diode (LED) panels. Experimental installations of laser lights, either at high power to provide a "line of light" in the sky or, utilising low power, aimed towards mariners have identified problems of increased complexity in installation and maintenance, and high power requirements. In any of these designs an observer, rather than seeing a continuous weak light, sees a brighter light during short time intervals. These instants of bright light are arranged to create a light characteristic or pattern specific to a lighthouse. For example, the Scheveningen Lighthouse flashes are alternately 2.5 and 7.5 seconds. Some lights have sectors of a particular color (usually formed by colored panes in the lantern) to distinguish safe water areas from dangerous shoals. Modern lighthouses often have unique reflectors or Racon transponders so the radar signature of the light is also unique. where H is the height above water in feet, and d is the distance to the horizon in nautical miles. Where dangerous shoals are located far off a flat sandy beach, the prototypical tall masonry coastal lighthouse is constructed to assist the navigator making a landfall after an ocean crossing. Often these are cylindrical to reduce the effect of wind on a tall structure, such as Cape May Light. Smaller versions of this design are often used as harbor lights to mark the entrance into a harbor, such as New London Harbor Light. Where a tall cliff exists, a smaller structure may be placed on top such as at Horton Point Light. Sometimes, such a location can be too high, for example along the west coast of the United States, where frequent low clouds can obscure the light. In these cases, lighthouses are placed below clifftop to ensure that they can still be seen at the surface during periods of fog or low clouds, as at Point Reyes Lighthouse. Another victim of fog was the Old Point Loma lighthouse, which was replaced in 1891 with a lower lighthouse, New Point Loma lighthouse. As technology advanced, prefabricated skeletal iron or steel structures tended to be used for lighthouses constructed in the 20th century. These often have a narrow cylindrical core surrounded by an open lattice work bracing, such as Finns Point Range Light. Sometimes a lighthouse needs to be constructed in the water itself. Wave-washed lighthouses are masonry structures constructed to withstand water impact, such as Eddystone Lighthouse in Britain and the St. George Reef Light off California. In shallower bays, Screw-pile lighthouse ironwork structures are screwed into the seabed and a low wooden structure is placed above the open framework, such as Thomas Point Shoal Lighthouse. As screw piles can be disrupted by ice, steel caisson lighthouses such as Orient Point Light are used in cold climates. Orient Long Beach Bar Light (Bug Light) is a blend of a screw pile light that was converted to a caisson light because of the threat of ice damage. In waters too deep for a conventional structure, a lightship might be used instead of a lighthouse, such as the former lightship Columbia. Most of these have now been replaced by fixed light platforms (such as Ambrose Light) similar to those used for offshore oil exploration. While lighthouse buildings differ depending on the location and purpose, they tend to have common components. A light station comprises the lighthouse tower and all outbuildings, such as the keeper's living quarters, fuel house, boathouse, and fog-signaling building. The Lighthouse itself consists of a tower structure supporting the lantern room where the light operates. The lantern room is the glassed-in housing at the top of a lighthouse tower containing the lamp and lens. Its glass storm panes are supported by metal Astragal bars running vertically or diagonally. At the top of the lantern room is a stormproof ventilator designed to remove the smoke of the lamps and the heat that builds in the glass enclosure. A lightning rod and grounding system connected to the metal cupola roof provides a safe conduit for any lightning strikes. Immediately beneath the lantern room is usually a Watch Room or Service Room where fuel and other supplies were kept and where the keeper prepared the lanterns for the night and often stood watch. The clockworks (for rotating the lenses) were also located there. On a lighthouse tower, an open platform called the gallery is often located outside the watch room (called the Main Gallery) or Lantern Room (Lantern Gallery). This was mainly used for cleaning the outside of the windows of the Lantern Room. Lighthouses near to each other that are similar in shape are often painted in a unique pattern so they can easily be recognized during daylight, a marking known as a daymark. The black and white barber pole spiral pattern of Cape Hatteras Lighthouse is one example. Race Rocks Light in western Canada is painted in horizontal black and white bands to stand out against the horizon. Range Lights in Margaree Harbour, Nova Scotia. When the vessel is on the correct course, the two lights line up above one another. Aligning two fixed points on land provides a navigator with a line of position called a range in the U.S. and a transit in Britain. Ranges can be used to precisely align a vessel within a narrow channel such as in a river. With landmarks of a range illuminated with a set of fixed lighthouses, nighttime navigation is possible. Such paired lighthouses are called range lights in the U.S. and leading lights in the United Kingdom. The closer light is referred to as the beacon or front range; the furthest away is called the rear range. The rear range light is almost always taller than the front. When the vessel is on the correct course, the two lights line up vertically. But when the observer is out of position, the difference in alignment indicates the proper direction of travel to correct the course. In the United States, lighthouses are maintained by the United States Coast Guard (USCG). Those in England and Wales are looked after by Trinity House; in Scotland, by the Northern Lighthouse Board; and in Ireland by the Commissioners of Irish Lights. In Canada, they are managed by the Canadian Coast Guard. In Australia, lighthouses are conducted by the Australian Maritime Safety Authority. The Soviet Union built a number of automated lighthouses powered by radioisotope thermoelectric generators in remote locations. They operated for long periods without external support with great reliability. However numerous installations deteriorated, were stolen, or vandalized. Some cannot be found due to poor record keeping. As lighthouses became less essential to navigation, many of their historic structures faced demolition or neglect. In the United States, the National Historic Lighthouse Preservation Act of 2000 provides for the transfer of lighthouse structures to local governments and private non-profit groups, while the USCG continues to maintain the lamps and lenses. In Canada, the Nova Scotia Lighthouse Preservation Society won heritage status for Sambro Island Lighthouse, and sponsored the Heritage Lighthouse Protection Act to change Canadian federal laws to protect lighthouses. Many groups formed to restore and save lighthouses around the world. They include the World Lighthouse Society and the United States Lighthouse Society. A further international group is the Amateur Radio Lighthouse Society, which sends amateur radio operators to publicize the preservation of remote lighthouses throughout the world. Lighthouses were once regarded as an archetypal public good, because ships could benefit from the light without being forced to pay. The Confederate States Constitution explicitly allowed public funds to be spent on navigation, including lighthouses. ^ "Eddystone – Gallery". Trinity House. Archived from the original on 2006-09-09. Retrieved 2010-05-03. ^ Douglass, James Nicholas (1878). "Note on the Eddystone Lighthouse". Minutes of proceedings of the Institution of Civil Engineers. vol. 53, part 3. London: Institution of Civil Engineers. pp. 247–248. ^ a b "NLB – Robert Stevenson". Retrieved January 28, 2013. ^ "Lamp Glass Replacement Glass Lamp Shades, Oil Lamp Shades, Oil Lamp Chimneys, Oil Lamp Spares". Archived from the original on 2014-01-06. ^ "John Richardson Wigham 1829–1906" (PDF). BEAM. Commissioners of Irish Lights. 35: 21–22. 2006–2007. Archived from the original (PDF) on 2012-03-12. ^ "The Linde Group - Gases Engineering Healthcare -". Retrieved 6 April 2017. ^ "Lighthouse". Encyclopædia Britannica. Retrieved 2014-01-06. ^ Watson, Bruce. "Science Makes a Better Lighthouse Lens." Smithsonian. August 1999 v30 i5 p30. produced in Biography Resource Center. Farmington Hills, Mich.: Thomson Gale. 2005. ^ "Maritime Heritage Program - National Park Service". Retrieved 6 April 2017. ^ "Lighthouses of British Columbia". ^ Guigueno, Vincent. "Review of Thobie, Jacques, L'administration generale des phares de l'Empire ottoman et la societe Collas et Michel, 1860–1960. H-Mediterranean, H-Net Reviews. January, 2006". Humanities and Social Sciences Net Online. Retrieved 2010-09-20. ^ "Lighthouses: An Administrative History". Maritime Heritage Program – Lighthouse Heritage. U.S. National Park Service. Retrieved 2008-06-10. ^ "Lasers". Aids to Navigation Manual. St Germain en Laye, France: International Association of Marine Aids to Navigation and Lighthouse Authorities: 43. March 2010. ^ "How far is the horizon? - BoatSafe Kids!". ^ "Light Station Components". nps.gov. ^ "RTG Heat Sources: Two Proven Materials - Atomic Insights". 1 September 1996. Retrieved 6 April 2017. ^ Douglas Franklin. "Lighthouse Bill Protecting Our Lighthouses – The Icons of Canada's Maritime Heritage". Featured Heritage Buildings. Canadian Heritage Foundation. Archived from the original on 2008-05-13. Retrieved 2008-06-10. ^ "The United States Lighthouse Society - Home Page". ^ "Amateur Radio Lighthouse Society – Contacting the Light Beacons of the World". Retrieved 6 April 2017. ^ "The Avalon Project : Constitution of the Confederate States". Yale Law Web. March 11, 1861. Archived from the original on September 15, 2012. 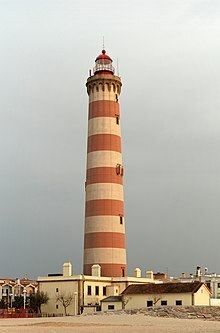 Wikivoyage has a travel guide for Lighthouses. Rowlett, Russ. "The Lighthouse Directory". University of North Carolina at Chapel Hill. Research tool with details of over 14,700 lighthouses and navigation lights around the world with photos and links. Pharology Website: http://www.pharology.eu . Reference source for the history and development of lighthouses of the world.